New to the park in 2017, the Ron Allen Memorial Disc Course is located right here at HTR! The course was designed by Ron Allen’s grandson, Ethan Tschanz and world famous disc golfer, Eric McCabe. It has been a popular addition to the park! Ron saw the vision of HorseThief Reservoir and played a HUGE role in bringing the park to life. Unfortunately, Ron passed away just a few months short of seeing water come into the Reservoir. Hodgeman County remembers Ron fondly and is thankful the family continues to be such active campers to HTR! There are no fees to play the Disc Golf Course; just a $5.00 daily vehicle permit! There are 18 holes which are laid nicely around the south end of the lake. Tell me more about Disc Golf! The surviving family of Ron Allen has chosen to dedicate the remaining Ron Allen Memorial funds to the installation of a 9-hole disc golf course at HorseThief Reservoir. Ron served as the manager of the Pawnee Watershed from 2001-2010. Words cannot describe the role that Ron played in making HorseThief Reservoir a reality. Ron himself had plans to install a course once the Reservoir was well-established. We believe this would be an excellent way to honor Ron and add to the already thriving list of recreational activities available at HorseThief Reservoir. Through the support of local sponsors to compliment the existing funds, we will be able to expand to a top-notch 18 hole course with extra amenities such as: shelter house, restrooms, concrete tee pads, bench seating, trash receptacles, professional course designer consultation, etc. Please consider sponsoring. With your help, we can ensure that yet another one of Ron’s visions becomes reality. Disc golf is one of the fastest growing sports in the world. This is especially true in Kansas, which has accumulated over 100 courses in the last 30 years. Disc golf is similar to traditional golf in playing style, yet unique in many ways. The object of the game is to get your disc into the basket to complete the hole in the least amount of throws. Disc Golf is played like traditional “ball” golf, but with flying discs instead of balls and clubs. One point (stroke) is counted each time the disc is thrown and when a penalty is incurred. The player with the lowest total strokes for the entire course wins. The lie is the spot where the player’s previous throw has landed. Players must throw from behind their lie on each shot. If a player’s lands in out of bounds territory, the player must throw from the last place the disc was in bounds and add a penalty stroke. Literally anyone! Men, women, and children of all ages enjoy playing disc golf. Disc golf is a great activity for friends, families, and complete strangers to enjoy together. 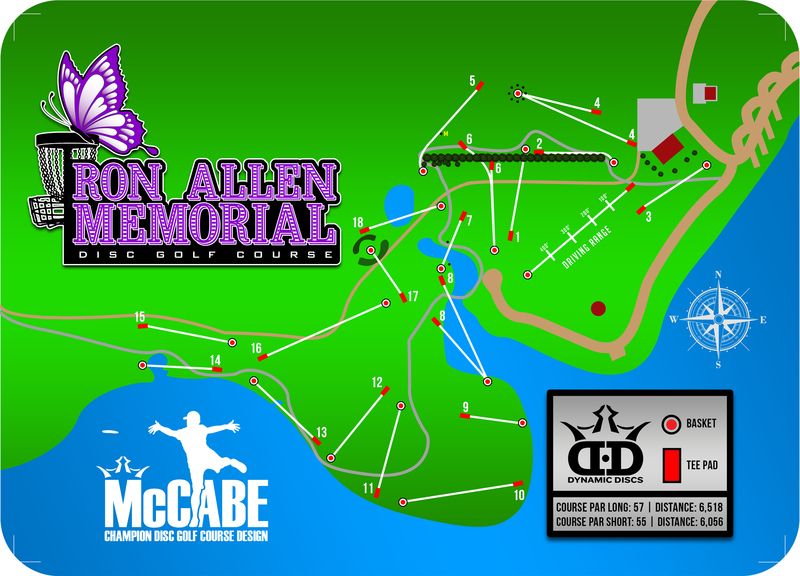 Follow the Ron Allen Memorial Disc Golf Course on Social Media! Want to do more? Check out all the other fun activities HorseThief Reservoir has to offer.